If the only thing more expensive than good design is bad design, then the only thing more heartbreaking than bad design is design that fails to achieve the right market fit. Many businesses have improved the process of designing customer-centric products by embracing design thinking, a process for exploration of unconventional solutions that lead to innovation. But design thinking alone does not result in products that achieve production and scale. To design and launch products that fulfill their potential, businesses need to complement design thinking with lean innovation. In the age of the customer, most companies need to deliver high-impact products and experiences to market with extremely high velocity, which has given rise to design thinking. Design thinking, when done right, ensures that a business points its product delivery process at the right problem. But too often, companies overinvest in design thinking without developing an iterative delivery process required to develop and scale the outcome of design thinking. The lean innovation process fills the gap between design thinking and scaling an idea. Lean innovation is a product development methodology for delivering lovable products for people with velocity, consistency, and flexibility within the constraints of the business. With lean innovation, cross-functional teams collaborate on holistic product design in an iterative, agile fashion. Teams design holistically to describe the ideal customer experience, then collaborate to create a minimum lovable product (MLP) – the version of the product that creates maximum customer love with the least amount of effort and expense. Leveraging the working models of the agile development mindset, lean innovation teams collaborate across product, design, and engineering to move into the blueprint and build rhythm of scrum delivery. Then, as the product takes shape and is positioned for market, the lean innovation process ensures the MLP is set up for success by surrounding it with the right people, processes, and governance. Lean innovation is not the same as agile development, in which teams collaborate on design in iterative fashion. Lean innovation is bigger than agile development because of lean innovation’s broader focus on people, processes (while include agile), and governance. Lean innovation is a by-product of the digital age, in which businesses are constantly being challenged by disruptive models developed by nimble entrants that lack barriers to entry. But just because a startup lacks barrier to entry, it doesn’t mean a startup can flourish. Lean innovation helps big companies apply their scale and reach with product development. At Moonshot, we continually rely on the benefits of these two complimentary mindsets to help our clients. For example, the majority of our projects begin by employing design thinking to ideate a solution. Specifically, we tend to use an adaptation of the Google Ventures design sprint process where we start with a core question and target consumer to frame our exploration and ideation activities. 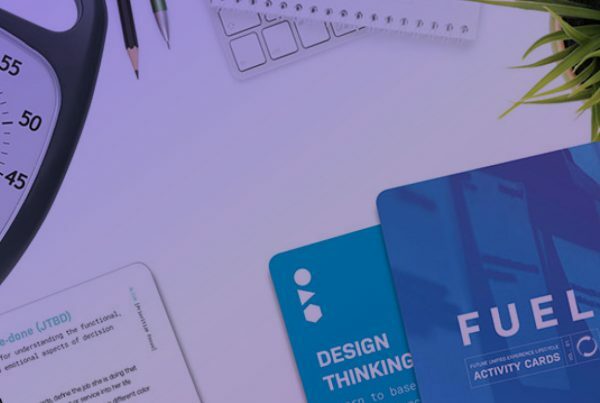 Our cross-functional teams then sketch, prototype, and, ultimately, validate the solution with real customers – identifying the first level of fit. Further, we really push at this stage to combine the lessons learned from the initial prototype with our efforts to define a broader holistic vision for the customer experience. The goal here is to leverage the empathy-based research of our design thinking activities to ensure “love”, and then use a set of MLP product planning activities to define the most lovable experience possible within the constraints of the business. From here, we’re ready to rapidly build the solution by applying our lean innovation methodology. We design and build using the MLP as our north-star as we iterate through agile delivery sprints, blueprinting and building the product via the rhythm of scrum. We also find that the lean innovation methodology supports meaningful discussions with our clients regarding organizational structure and the skill sets they need to successfully support the new solution prior to market launch. Likewise, lean innovation lends itself to the model of continual improvement of the solution as we work with clients to monitor its performance, and make refinements based on data and insights gleaned from usage. Applying lean innovation need not be a disruptive, complicated process. In most cases, embracing lean innovation means adjusting how teams collaborate. Many businesses are familiar with the process aspect of lean innovation (e.g., the use of agile). The biggest disconnect occurs with the players not being set up to collaborate. Lean innovation can be the catalyst that businesses need to compel their design and development teams to collaborate from ideation to execution. Contact Moonshot for more insight into how to get started with lean innovation. Previous PostWhere Is Apple Going with Augmented Reality?